With its shelves emptier than ever, the Greater Vancouver Food Bank is calling on the community to help it keep up with the growing number of Metro Vancouverites struggling to put food on the table. According to its CEO, the organization saw a 22 per cent spike over the summer in the number of people who need help getting enough to eat. "I think we're at a stage where a lot of people needed extra help to stay afloat. We've been here to help them, of course, but…our shelves are really empty and we needed help," Aart Schuurman Hess told CTV News Wednesday. "We are asking the community today to step up to help for the Greater Vancouver Food Bank." The region's deepening affordability crisis has created something a vicious cycle for the organization: many of those who've been on the bubble are no longer able to make ends meet, while a growing number of people who until now have had enough to spare no longer do. "People are struggling to get food on their tables, that's what we notice and that's why the food bank really need the support of the community to continue to help families," Schuurman Hess said. An Angus Reid survey released in July found almost a third of Canadians are "very stressed" about money on a regular basis. Of those surveyed, one in four said they'd borrowed money just to be able to afford groceries. Meanwhile, food prices rose three per cent this year, a tipping point for many Lower Mainland families. And the situation doesn't seem likely to get better. Canned food products could soon cost more due to tariffs in the ongoing trade spat between Canada and the United States. In B.C., gas prices are at an all-time high, car insurance is becoming increasingly unaffordable and the cost of housing continues to grow beyond the means of many residents. With all of those expenses added together, Schuurman Hess said those hardest hit by the skyrocketing cost of life in Metro Vancouver need the food bank's services now more than ever. "It's all getting more expensive," he said. "I think there's a lot of people that were just pushed over the edge and we're here to help, but we also need the community to help us to make sure that we can continue to provide food to those who really need it." The CEO said the food bank aims to provide those who access its locations with two days' worth of food—a total of six meals and four healthy snacks—but it could be forced to reduce how much it can give if donations don't ramp up soon. The organization will hold its third annual Citywide Food Drive over the weekend drive in an effort to replenish its food stock. Staff have left paper bags on doorsteps across the region. Schuurman Hess said those who want to donate can fill them with "wholesome," non-perishable food items such peanut butter, beans and canned meats and drop the bags off at one of three drop off locations in Vancouver, Burnaby and North Vancouver. GVFB has also partnered with Save-On-Foods where shoppers can buy the groceries they wish to donate and drop them off in-store after they check out. The organization also accepts monetary donations that can be made online. Staff use the money to buy food that will go to those in need. 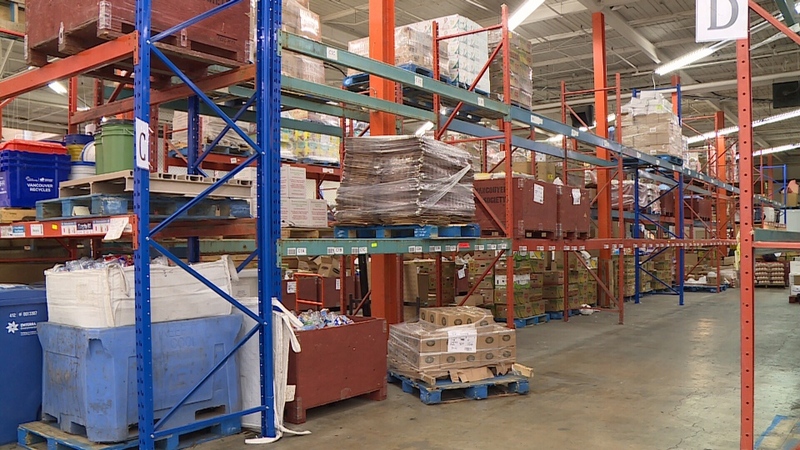 The food bank helps about 27,500 people every week. According to its website, 22 per cent of those are children and another 22 per cent are seniors. Empty shelves are seen at the Greater Vancouver Food Bank on Sept. 12, 2018.